All-in-one mutual funds for people nearing retirement face tough decisions on how much risk—and which risks—to take in search of decent returns. 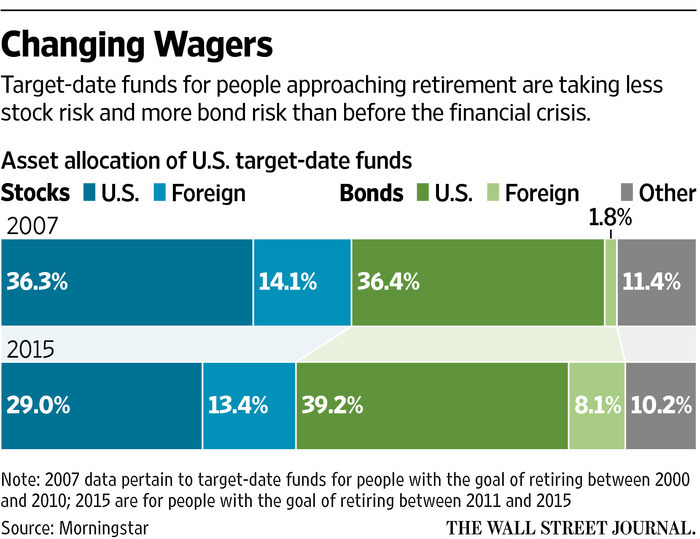 When the stock market tumbled in 2008, “target date” funds for people planning to retire in 2010 sustained heavy losses. Since then, sponsors of these funds, which specify a likely retirement year in their names and are widely offered in 401(k) retirement plans, have generally lightened up on stock exposure for investors approaching retirement. But as fund managers have raised allocations to bonds, these portfolios have grown more exposed to the negative impact on bond prices of rising interest rates—a concern now that the Federal Reserve has embarked on what is expected to be a series of U.S. interest-rate increases.